Product Description: NEW GENUINE OEM MOPAR FOG LIGHTS FITS 2009 TO 2010 DODGE RAM 1500 Fog Lights Mopar's Fog Lights undercut inclement weather and minimize glare. 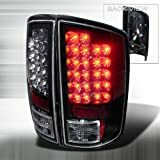 They are designed specifically for your vehicle and provide an integrated look. SAME AS PRODUCTION KIT INCLUDES , WIRING, SWITCH & LIGHTS, EVERYTHING YOU NEED TO COMPLETE INSTALLATION. 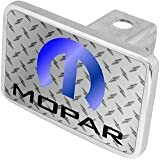 Product Description: Mopar small block chrome steel short style valve covers fit 1967-1989 Mopar 318-340-360 small block engines. Product Description: This is the Parts List Catalog created by the factory. Includes part number, common name & application. Labeled blown up "exploded views" of the parts, showing what they look like and how they fit together with their adjacent parts. 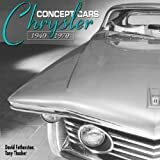 Product Description: A Detroit Free Press reporter demythologizes Lee Iacocca’s leadership of Chrysler, demonstrating how salesmanship and self-promotion invariably trumped innovation and investment. “Everyone who cares about american industry should read [this book]” (New York Times Book Review). Index. Product Description: Hundreds of thousands of racing enthusiasts rely on this essential guide for building a race-winning, high performance big-block Mopar. Includes detailed sections on engine block preparation, blueprinting and assembly. Product Description: Revive the muscular good looks and horsepower of your E-body! This helpful guide contains hundreds of detailed photos, factory illustrations, and helpful data tables covering everything from decoding VIN tags to applying the correct finish to virtually every part on your car. All the information you'll ever need to authentically restore your monster-engine musclecar to show-winning perfection! Product Description: Covers all U.S. and Canadian models of Chrysler 300, Dodge Charger and Magnum. Product Description: Covers U.S. and Canadian models of Chrysler Town & Country, Dodge Caravan, Grand Caravan, Plymouth Voyager and Grand Voyager. Product Description: Haynes disassembles every subject vehicle and documents every step with thorough instructions and clear photos. Haynes repair manuals are used by the pros, but written for the do-it-yourselfer. Product Description: This manual contains hundreds of photos and illustrations of repair procedures. Product Description: From the high-revving small blocks to the fire-breathing Hemis, this is your best source for finding parts that may be interchanged among the many Chrysler models. Whether you own a Barracuda, Challenger, Road Runner, Super Bee or Charger, this full listing of all the interchangeable "line" parts for your Chrysler muscle car will provide you with the information you're looking for! Product Description: Celebrating 60 of America's best-loved automobiles, this full-color car show spotlights the most glamourous cars of the golden era from 1945-1975. The text, by the author of The Ultimate Classic Car, and more than 680 lavish full-color photos reveal the design flourishes that make each car a classic. Product Description: Everything from in-depth build-ups to the latest in fuel injection adaptations! Ceridono masterfully details street, race, marine, blown and naturally aspirated engines for Chrysler, Dodge, and DeSoto. Contains complete identification and specifications for all models, plus Polyspheres, the new 426 crate motors, and conversions. Dodge & Plymouth Muscle Car Red Book, 2nd Ed. Product Description: The complete collectors reference to Mopar muscle cars just got even better with updated information covering the Dart and Demon as well as recent sensations like the Dodge Viper. This information-packed pocketbook also features production numbers, factory colours, options, specifications, serial numbers, and much more. Product Description: Dodge Caravan, Plymouth Voyager, Haynes. Spanish text. 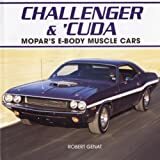 Product Description: The ultimate Chrysler pony car book written in Peter’s now familiar and welcome unpretentious style, that features every series and model of pony car made by the Chrysler Corporation in the 1960s and 70’s including the slippery Barracuda and classic Dodge Challenger along with stars of the big screen and drag strip. Product Description: NEW GENUINE OEM MOPAR CHROME STAINLESS STEEL EXHAUST TIP FITS 2003 TO 2009 DODGE RAM 2500/3500 WITH DIESEL ENGINES PART # 82208243 CHROME STAINLESS STEEL EXHAUST TIP, 5" OD & 4" ID Chrome Exhaust Tips enhance the appearance of your vehicle's existing exhaust system. Chrome Exhaust Tips add a sporty finished look and are easily installed. Product Description: Dodge Ram Logo 4 Pc Floor Mats Set. Plasticolor "molded-in" DODGE RAM LOGO design floor mats. Heavy-duty Plastisol construction with recessed grid pattern. Universal size fits almost all vehicles. Size is approx. 26" x 16.5" for fronts and 14" x 17" for rears. Price is for a pair of front mats and 2 rear mats. Product Description: Based on a complete teardown and rebuild of the specific vehicle. Feature hundreds of "hands-on" photographs taken of specific repair procedures in progress. Include a full chapter on scheduled owner maintenance. Devote a full chapter solely to emissions systems. Have wiring diagrams published in each manual. Product Description: Simply plug your iPod into the custom cable located in the glove box and youre ready to go. iPod integration means you can navigate your iPod through your radio controls. With this simple "plug and play" hook up, your iPod stays securely attached, outof view and continually charging. Product Description: Welded aluminum faceplate and shaft for enduring quality and ease of maintenance. 2" x 2" shaft fits Class III and Class IV Hitches the 4" x 6" faceplate has a polished 1/4" border. Laser-cut and hand assembled 1/8" acrylic inserts. Product Description: Covers all aspects of interest to Chrysler-oriented performance enthusiasts. 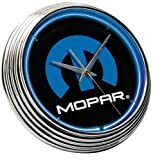 Product Description: On The Edge Mopar Neon Clock is designed to keep track of the time as well as to boost up the garage, game room, bar, saloon or office with its stylish look. It features a radiant neon light ring that lines the inner ring of the clock and can be turned on or off with an effortless flick of a switch. This neon clock offers an adaptor and battery that are included to run the quartz clock movement. 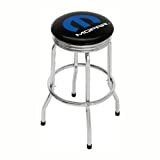 Product Description: On The Edge Mopar Single Foot Ring Barstool with Swivel is designed to jazz up your game room or garage with quality, style, and comfort. It is made from tubular steel frame and features non-skid foot pads. This barstool is extremely durable and easily fits any place. Product Description: The high-performance tale of what was undoubtedly the fastest, loosest era in automotive history. Specially commissioned photos plus dozens of archival "behind the scenes" shots offer an inside look at the technical development of each of Detroit's greatest muscle cars. Packed with posters, ads and memorabilia that capture the flavor of raw horsepower. 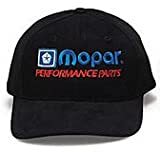 Product Description: Feel the Hemi horsepower as Dennis Gage travels the country to bring you some of the most awesome Mopars to ever hit the street. 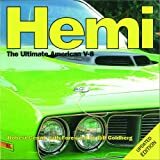 This DVD is loaded with terrific car footage and includes interviews with designers and engineers, as well as an in-depth look at the development of the original 426 Hemi. Rev it up for a trip back to the heyday of classic Mopar Muscle! 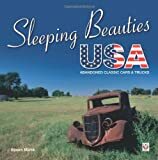 Product Description: Sleeping Beauties USA honors rusted and forgotten automotive treasures that have been found parked alongside the highways of America, waiting to be discovered again. Rather than showcasing typically brilliant, highly rebuilt show queens, the book instead explores the transience and inherent beauty of a car’s life, captured through stunning and evocative photography. Product Description: The first comprehensive biography of John and Horace Dodge and the history of their company, Dodge Brothers. 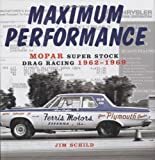 Product Description: This book provides step-by-step instructions for how to modify Chrysler's A-727 Torqueflite automatic transmission for drag racing, road racing, and circle racing. Topics include theory of operation, transbrakes/valve bodies, adapters, dissembly, modifications, assembly, adjustments, installation, high horsepower application, and torque converters.